Veneris, 28 die Martii, 1679. Letter sent to Mr. Speaker. Resolution concerning Information against a Member. A BILL for the better Securing the Liberty of the Subject, was read the First time. Resolved, &c. That the Bill be read a Second time on Monday Morning after Ten of the Clock. Ordered, That the Members of this House that serve for the City of London, do examine the Matter concerning the Letter sent to Mr. Speaker, and report the same to the House. A Petition of Sir Christopher Calthorpe Knight of the Bath, praying longer Time for the Hearing of the Cause between him and Sir John Hobart Baronet; for that he is visited with the Small Pox; and cannot be able to attend the House, or produce his Witnesses, by the Eleventh of April, which is the Time appointed by an Order of this House for the Hearing of the said Cause at the Bar of this House; was read. 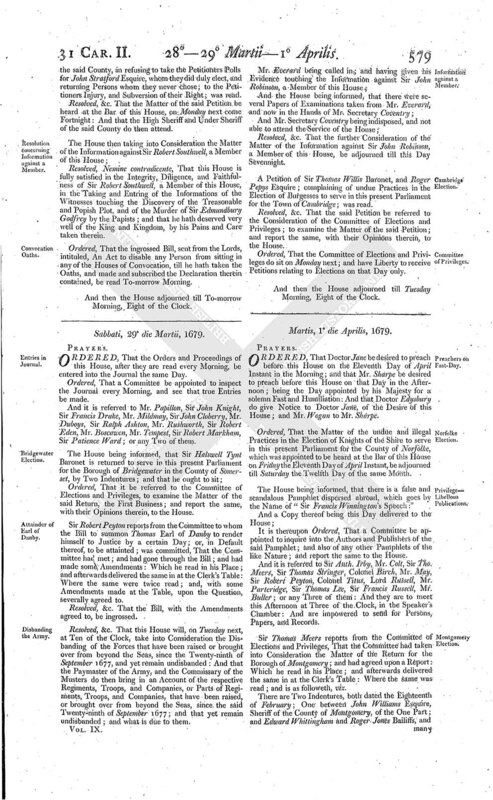 A Petition of Ralph Stawell Esquire, praying that the Merits of the Election for the Borough of Bridgwater may be heard with the Merits of the Return, on the One-and-twentieth Day of April next; which is the Day appointed by the Committee of Privileges and Elections, further to consider of the Merits of the said Return; was read. Resolved, &c. That the said Petition be referred to the Consideration of the Committee of Privileges and Elections. A Petition of William Clarke Esquire, complaining of several undue Practices in the Election and Return of Burgesses to serve in this present Parliament for the Borough of Bridgwater in the County of Somerset, in Injury of the Petitioner, who had the Majority of rightful Voices, was read. Resolved, &c. That the said Petition be referred to the Consideration of the Committee of Privileges and Elections: And that the Committee do make a Special Report of the Matter of the said Petition. Resolved, &c. That the said Petition be referred to the Consideration of the Committee of Privileges and Elections; to examine the Matter thereof; and report the same, with their Opinions therein, to the House. Mr. Chancellor of the Exchequer acquaints the House, That his Majesty had been attended with the Address of this House, desiring his Majesty, That all Papers and Examinations, relating to the Discovery of the Plot, may be transmitted to the Committee of Secrecy: And his Majesty was pleased to say, That those Papers were before the Committee of Lords; but he would give Order to the Lord Chancellor, to get them dispatched there with all Expedition, and to deliver them to the Committee of Secrecy appointed by this House. A Petition of Richard Derham Esquire, complaining of an undue Return of Sir Edward Harley, to serve in this present Parliament as Burgess for the Borough of New Radnor, in Injury of the Petitioner, who was duly elected, and ought to have been returned, was tendered to be read. And Mr. Deerham, being called in to the Bar of this House, did own the said Petition. A Petition of Edward Hales, complaining of undue Practices used by the Mayor of Queenborough in the County of Kent, in returning James Herbert Esquire, to serve in this present Parliament as One of the Burgesses for the said Borough, in Injury of the Petitioner, who was duly elected, and ought to have been returned, was read. A Petition of Algernon Sydney Esquire, complaining of an undue Return of Thomas Dalmahoy Esquire, to serve in this present Parliament as One of the Burgesses for the Borough of Guilford in the County of Surrey, in Injury of the Petitioner, who was duly elected, and ought to have been returned, was read. A Petition of John Pollen Esquire, complaining that William Withers Esquire, combining with the Bailiff of the Borough of Andover in the County of Southampton, did, by several illegal and unwarrantable Practices, procure himself to be returned to serve in this present Parliament as One of the Burgesses of the said Borough, in Injury of the Petitioner, who was duly elected, and ought to have been returned, was read. 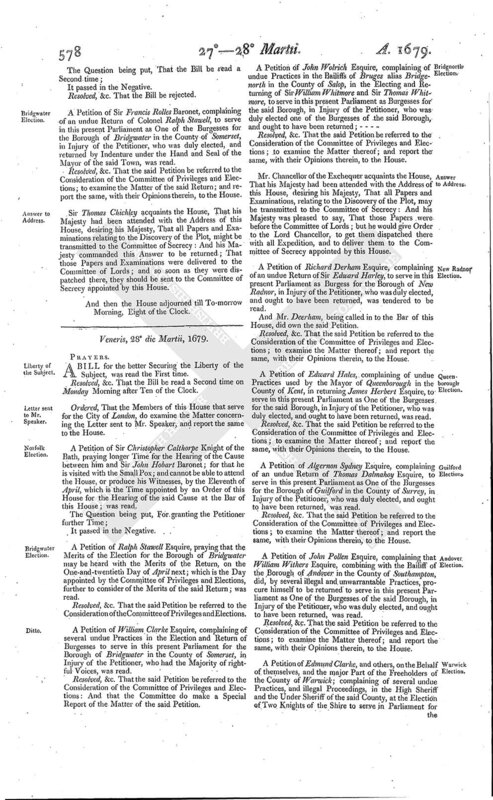 A Petition of Edmund Clarke, and others, on the Behalf of themselves, and the major Part of the Freeholders of the County of Warwick; complaining of several undue Practices, and illegal Proceedings, in the High Sheriff and the Under Sheriff of the said County, at the Election of Two Knights of the Shire to serve in Parliament for the said County, in refusing to take the Petitioners Polls for John Stratford Esquire, whom they did duly elect, and returning Persons whom they never chose; to the Petitioners Injury, and Subversion of their Right; was read. Resolved, &c. That the Matter of the said Petition be heard at the Bar of this House, on Monday next come Fortnight: And that the High Sheriff and Under Sheriff of the said County do then attend. Resolved, Nemine contradicente, That this House is fully satisfied in the Integrity, Diligence, and Faithfulness of Sir Robert Southwell, a Member of this House, in the Taking and Entring of the Informations of the Witnesses touching the Discovery of the Treasonable and Popish Plot, and of the Murder of Sir Edmundbury Godfrey by the Papists; and that he hath deserved very well of the King and Kingdom, by his Pains and Care taken therein. Ordered, That the ingrossed Bill, sent from the Lords, intituled, An Act to disable any Person from sitting in any of the Houses of Convocation, till he hath taken the Oaths, and made and subscribed the Declaration therein contained, be read To-morrow Morning.